With many types of animals, deciphering gender is as simple as observing differences in colors or patterns. With poison dart frogs, identifying gender is not as easy, since males and females look alike. 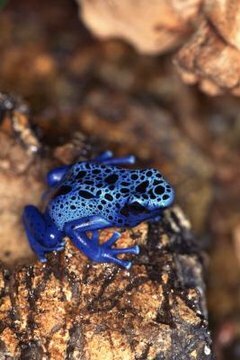 Nevertheless, several measures exist for telling male poison dart frogs apart from females. To determine gender, you must rely on small physical differences. Male poison dart frogs have unmistakably larger and wider toe tips than females. Males are also smaller than females, measuring up to 1.5 inches in length while females measure about 1.6 inches. To attract females for mating, males voice loud but brief chirping sounds. Females lay eggs on moist surfaces, at which point males fertilize them. Males frequently check on offspring until they hatch. Males are considered more active in caring for offspring, often being the sole provider of transportation for eggs and tadpoles. Poison dart frogs can be very aggressive. Males fight with other males over territories, while females fight with males during courting.